If you have not yet had taken your vehicle through emission testing, but your "check engine" light is on, you SHOULD NOT bring your vehicle to any shop (including ours) just yet. What you should do is go ahead and put your vehicle through testing and expect it to fail. THEN call and schedule your service with us to have the vehicle's issue corrected right after. To get your car's license renewed, your vehicle will be subject to an emissions test. If your car does not pass inspection you will need to get it repaired by an approved auto service facility, like Ali's Bellevue Auto Repair. 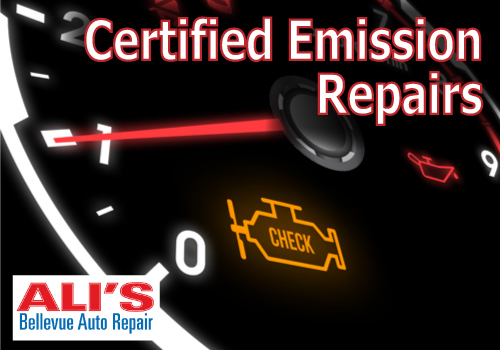 At Ali's we are not only state-approved but we are ready to help fix your vehicle with affordable, quality emissions repair. So if your car has failed the test bring in your vehicle right away and we will walk you through the process of needed repairs or help you get a waiver. To satisfy the requirements of emission repairs you will need to fix the problem or obtain a waiver (which is $150 spent toward fixing the vehicle). To obtain a waiver the amount needs to be spent AFTER the failed emissions, and any money used for repairs before the failed test will not be counted. At Ali's no matter what repair your car needs we are here to help! 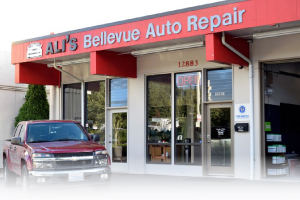 Ali's is Bellevue's one-stop shop for auto repair and services. We would love to partner with you to offer outstanding customer service and perform all types of repairs on any make or model of vehicle. Call 425-450-9713 today to schedule your appointment.